How do you make Star Wars and parties go hand in hand? 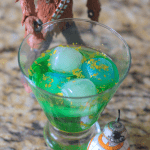 Okay I know this is totally nerdy maybe even geeky but this Galaxy Far, Far Away Star Wars Cocktail comes with so much awesomeness we cannot control ourselves not to share it with you! With greens and blue like the galaxy along with floating candy glitter in gold this drink will knock everyone out of the galaxy. 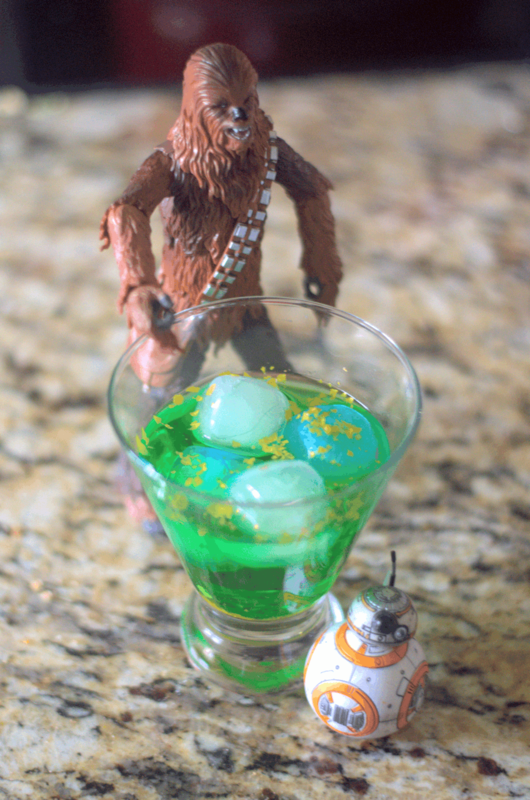 Ya’ll even Chewbacca and BB-8 are jealous of how cool this drink is. Made every simply with a raspberry vodka and a melon liqueur. This cocktail is all around fun for both ladies and gents. Remember before serving these drinks to make everyone put up their light sabers. Well, Okay at least their car keys 😉 Those storm troopers might catch you later on. That wouldn’t be much fun at all! 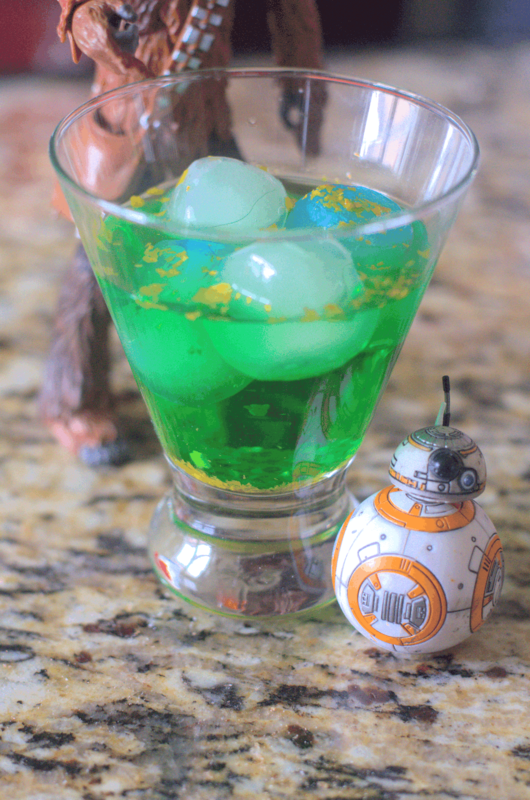 It’s finally time to celebrate the release Rogue One with an intergalactic libation. 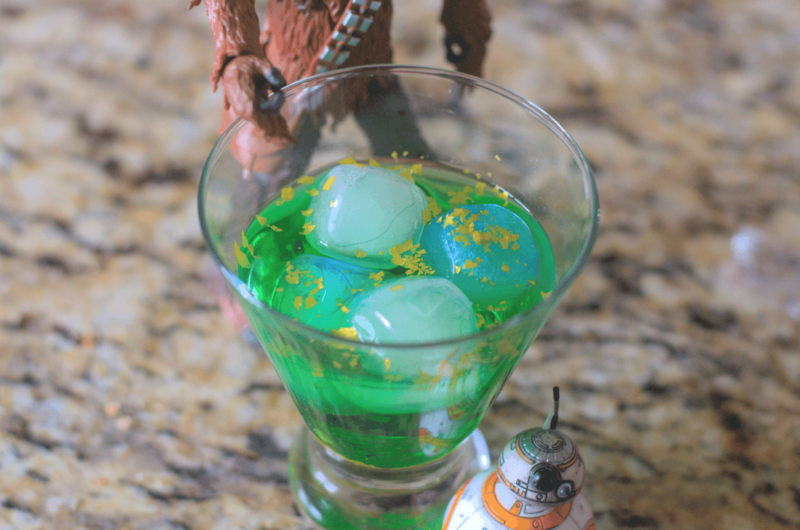 This Star Wars cocktail will tickle even the most serious Chewbacca impersonator when garnished with those gold glitter candy flakes. Tell me have you seen Rogue One? Don’t give any spoilers but I would love to hear what you thought yay or nay? We’ve heard some good. Also some retro feeling throw back to the older films. We’d love to hear what you though of the movie. Of course, this cocktail too. Add ice to a cocktail glass. Pour in a little melon liqueur then some raspberry. Repeat process until mini bottles or both parts are empty. Top with gold glitter candy flakes.